Will setting up the Lokpal help in combating corruption? 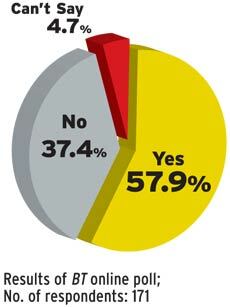 Majority of respondents believes that creation of the institution of Lokpal will help fight corruption effectively. No doubt, corruption is the biggest scourge facing India today; if unchecked, it will deal a body blow to the India Shining story. But this belief in the effi cacy of the Lokpal also stems from frustration over the failure of the existing institutional mechanisms to deal effectively with corruption. It was this frustration that recently saw people from all walks of life join social activist Anna Hazare in demanding the immediate creation of the Lokpal with suitable amendments in the draft Bill. After all, the demand for this has been hanging fire since 1968.